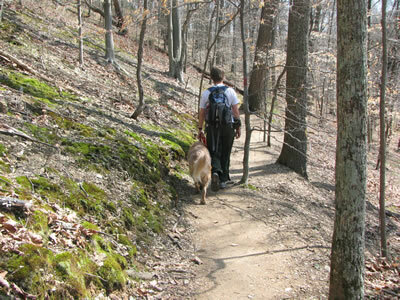 Mossy Ridge is our favorite Nashville trail. 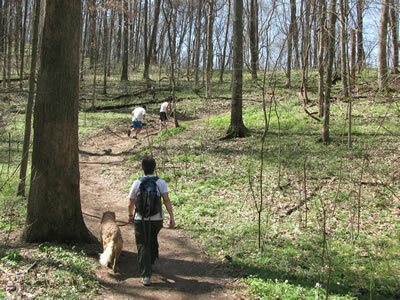 It is a good hike, training hike (with pack), or run. 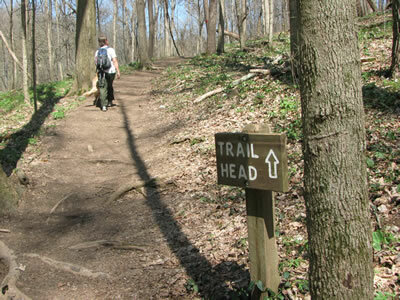 The trail has enough ups and downs for a good workout. It is rated as moderate. 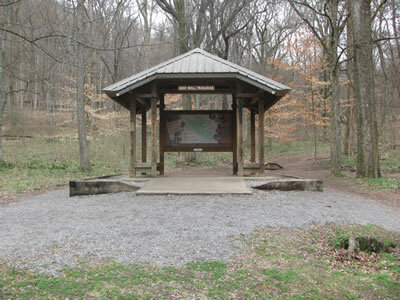 Starting at Deep Well Trailhead, go past the trail kiosk, cross the horse trail, and climb a short hill to a tee. 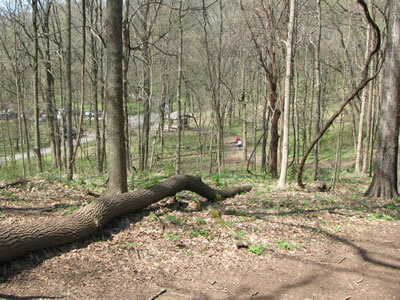 The Tee, Warner Woods (white) to the left, Mossy Ridge (red) to the right. 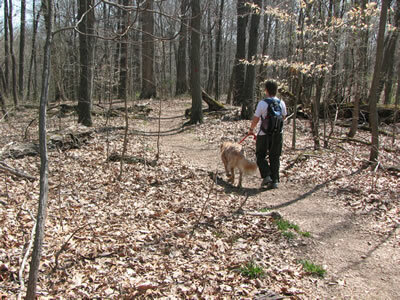 The trail intersects the connector link between Warner Woods (white blazed trail) and Mossy Ridge (red blazed trail). Go right. 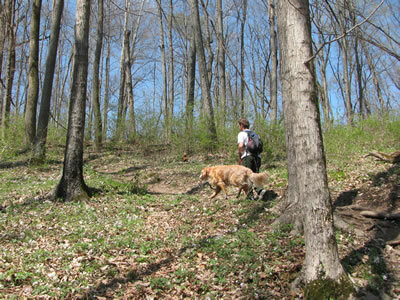 In a short distance the trail climbs a few exposed rocks and then descends to the Mossy Ridge Loop intersection. 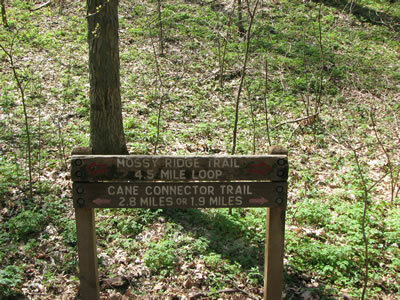 The Mossy Ridge Trail can be hiked in either direction, but the description will follow the trail counter-clockwise or to the right. The trail contours easily and crosses the horse trail. 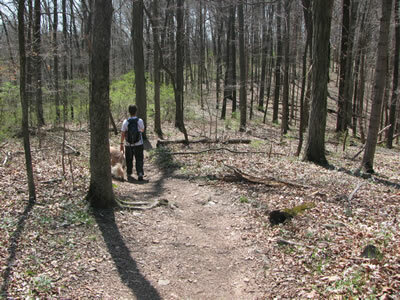 Descending the trail goes into a drainage and then climbs a short but steep hill to Quiet Point. 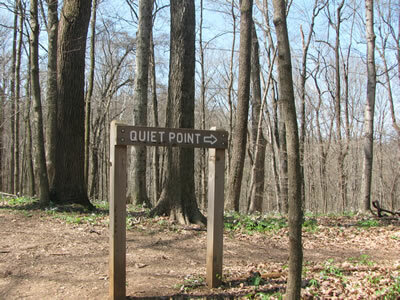 A short side trail leads to the Quiet Point (with a bench). From Quiet Point the trail continues on an easy grade and then makes a good climb to the road. On the road the crossing is just before the crest of Three Mile Hill. At Dripping Springs either cross on some really slick rocks or take the by-pass trail to the creek below the slippery rocks and make a safer crossing. 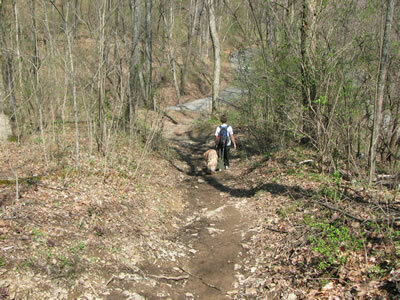 Back on the main trail follow along on an easy grade until the trail turns left and climbs a steep rocky slope. After the trail seems to be at the top of the hill, it still finds a way to go up more. 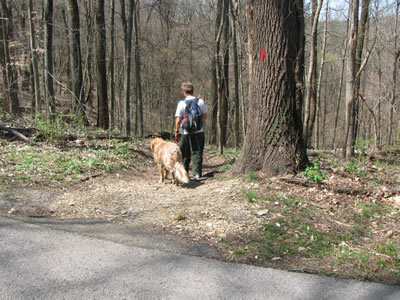 A short unofficial trail goes left at the top of the hill and joins the road at an overlook. 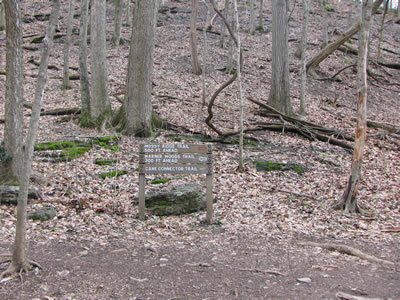 The junction at Three Mile Hill is to the left from the overlook. 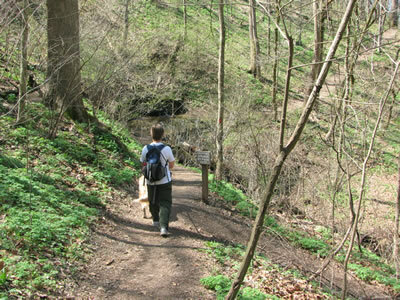 The trail dips down to the top of a hollow. The road is just above to the left. 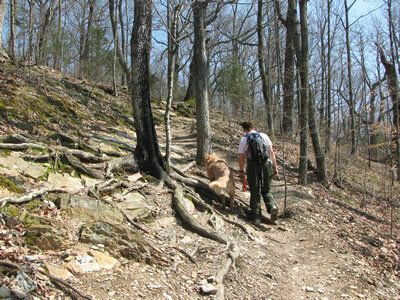 Climbing, the trail continues to the crest of a ridge and then descends to a dip between the ridge and a knob. It is a short climb to the top. 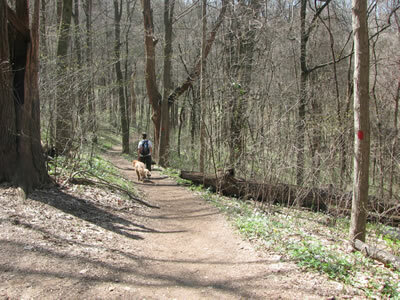 The trail descends with a sweeping turn to the right then left. Highway 100 is the noise to the right. Vaughn Gravel Road is below. 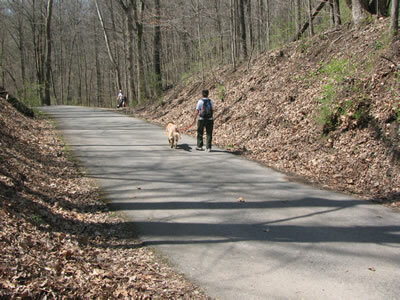 After contouring the trail descends to the junction of the Park road and the Vaughn Gravel Road. The cross-country course may be accessed at this point to the right. Cross the main road and climb a steep grade which is exposed to the sun. 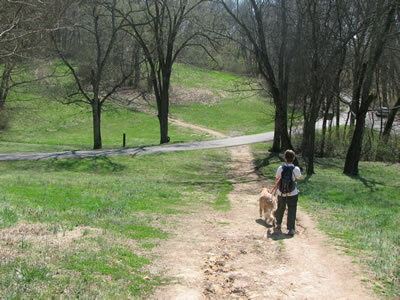 The junction with the Cane Connector Trail is at the top of the climb. 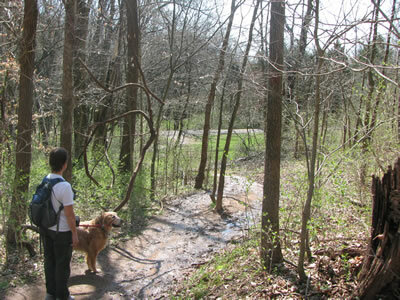 The Cane Connector Trail leads one mile to the Nature Center. 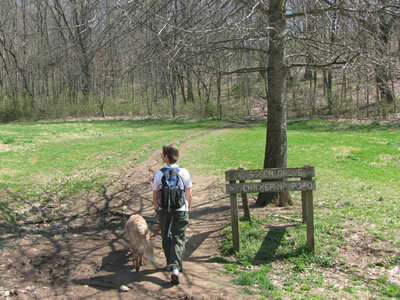 It is possible to start at the Nature Center to hike Mossy Ridge Trail. Using the Cane Connector adds two miles to the hike. From the junction the trail contours around the slope. After a nice rest on the easy grade a steep, but short, climb ascends a rocky slope. At the top of the climb the trail levels. 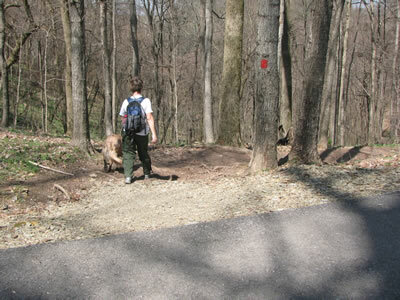 A great section of trail, the hiker is seen contouring around a curve. The trail is almost level. It is a pleasant quarter of a mile to the next road crossing. 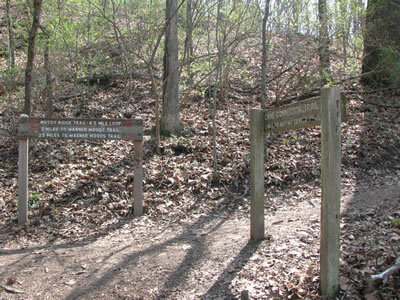 The horse trail crossing (to the right) is next to (parallel) the trail crossing. Cross the road diagonally and continue on easy terrain. Cross one horse trail and then another. At the second crossing the trail goes over or around to the right of a log and then climbs a good hill for a few hundred feet. 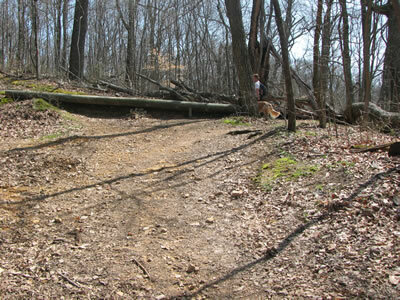 Picture taken from the horse trail crossing, either step over the log or go around to the right. The log helps divert rain water. The trail stays on top of the hill for .30 miles. The trail then descends to cross a horse trail and then join the gravel road which leads to Indian Springs. Go left on the gravel road to the intersection with the Park Road from Chickering Road. A short climb leads to another horse trail crossing. to the top of the ridge. Cross the road and climb steeply. The trail levels off and stays on the ridge for a while. This is the old Tornado Road. 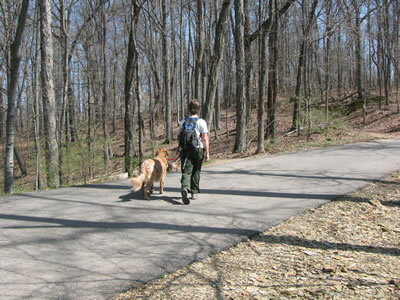 After a half of a mile on the ridge line, descend sharply to the Park Road. Turn left and walk along the road for a hundred yards before turning right to return to the trail. 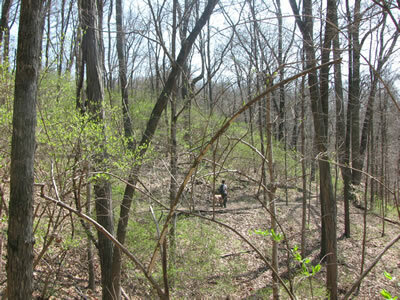 After a short stroll into the hollow, a drainage is crossed, and a climb ensues. 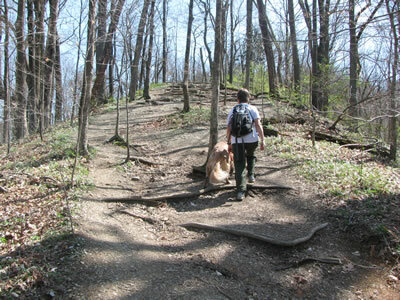 With a couple of switchbacks, the trail climbs steeply to top of Chimney Hill. Chimney Hill is named for the chimney of an old cabin on the other side of the hill. Cross the road and descend Chimney Hill. 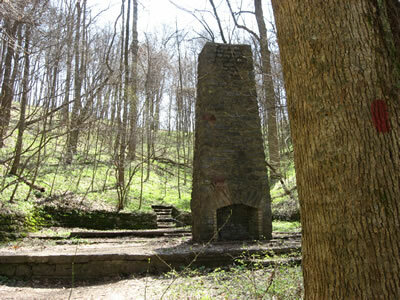 The chimney is on the left a the bottom of the hill. At the trail junction the loop is complete. Go right to return to the trailhead or straight for another lap! Going right on the connector, climb a short distance, contour the hill and turn left at the junction. 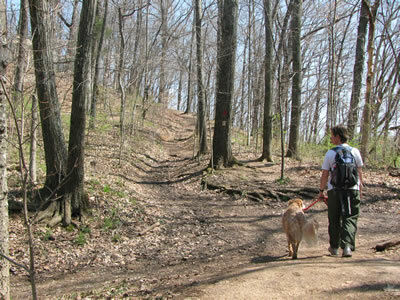 It is a short downhill to return to the trailhead.